So …. She came out of the cupboard. PS to KP – Sara’s Blog was public long before you came on the scene. His untimely death (in the care of your organisation ) was felt by all who knew of him. So many of us realised this could so easily have been our own son/daughter. I think I can safely say that (when you were confidently doing the right thing) stating that Connor died of natural causes was the first sign that your organisation was not quite what it should be. There didn’t seem to be any intention initially of commissioning an independent review. Look at #107 days. The anger and despair became solidarity. Positive actions. We want Justice For All The Dudes. The complacency around #DeathByIndifference must stop now. This is a deeply hurtful and dismissive letter. It damages the Trust and the NHS with its lack of insight and compassion. The ficus is only on the ‘self’ – ‘her Trust’, ‘her employees’, ‘her Chairman’. The inference to be drawn is – we are very busy and we have lots of things to do, many of which we are excellent at (and some not so good but, heh, we are working at it). We have apologised and offered you a meeting. This is the right thing to do. And we know this as we know best. What more do you want? You are just being a nuisance now and need to move on or shut up because this is getting in our nerves and tainting our lovely self-image. We don’t like to think of ourselves the way you describe us so none of what you say can be true. We are not changing. You must do thinks our way. Oh, and I am transparent but I’m just not answering you! Some of your questions fall within the FOIA and she should have thought of that before she decided to refuse to engage. Appalling, lacking in insight or perspective and a poor reflection on NHS management and ‘her Trust’. But above all, hurtful, bureaucratic, impersonal and unnecessary. Shame in the Trust for letting this be sent out. Also, there must be a genuine fear of litigation lifting the lid on the rose tinted self-image you’ve created for yourself. Units failing standards so badly they’ve had to close. More than one unit involved. A young person dies. It is suggestive of systemic failings not ‘one-offs’. But why write at all if you’re going to write this? So many times we see people fighting for justice for years and then the body in question when proved to be at fault decides to accept its responsibility. But only then. comfort in the knowledge that she clearly has the backing of a large and powerful organisation! Words fail me. “Friends and supporters” That phrase (along with rather a lot of others – in fact, practically every word) really jars. You have them, of course. But what is this “support” that can make the slightest real difference to the fact that you lost your son? And how can she possibly think you would want it from her of all people. I am not a friend, and I don’t see myself as a supporter either in the partisan sense KP would like to imply and I find the idea that there could be two perspectives on this appalling tragedy incomprehensible. Football teams have supporters. What KP is up against is people who want a lot better than this, who can see that it is because of attitudes like this, this blind complacency and deep rooted indifference that our charges are not safe. A meeting, with false assurances, can be spun. This letter is beyond parody, really. “We are wonderful, I am proud, and it doesn’t happen often” Dear God. And this woman is a mother? Doesn’t matter who wrote it, or what they thought it would achieve; that she could sign her name to it is shameful. Humility, compassion and some human understanding would not salve your pain, but to think corporate speak and attempts at smearing you would get her off the hook just reinforces how necessary it is to question this dangerous, offensive nonsense. I am neither a friend, relative or colleague of the author of this blog. I do not have a child with a disability. As such I have no personal investment in this particular case, and I am speaking to you as a member of the public who relies (like every other citizen of the UK) on the safety net supplied by our health and social services. The same services under the remit of the job you chose to pursue, and which you claim to be so deeply proud of. I prefer to believe that the arrogance of your letter comes from the misguided belief that refusing to publicly answer the mother of a child that died in your department’s care is a matter of privacy. I’d like to tell you that to the impartial observer your letter comes across as rude, cold, cruel, arrogant and deeply autocratic. Your casual dismissal of this mother’s valid questions is nothing less than a disregard of public accountability. You run a department of a National Service, funded by the public in the service of the voters of a democratic country. When you disregard the concerns of this mother you disregard the concerns of ALL of service users. When you refuse to engage with the people who pay for your job – and particularly the mother of a child that died in your department’s care – you no longer fulfill your public responsibility. If you ‘strongly believe’ that you are ‘completely correct’ in sending this hectoring, self-aggrandising excuse for a lecture, rather than simply taking it as an opportunity to answer the questions, then you are profoundly unsuited to your publicly-funded role in social care. 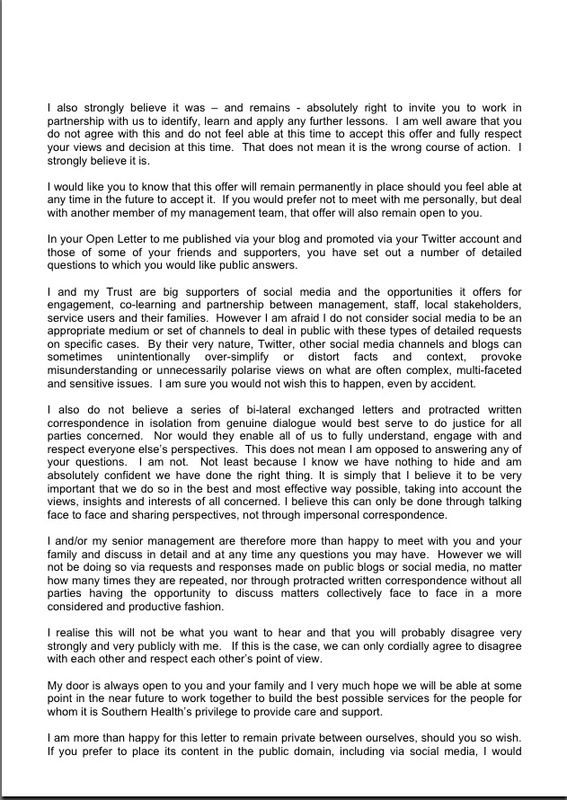 I can only urge you to take one of the two options open to you: publicly engage with this complaint, or resign. All other actions are merely adding insult to injury. An excellent letter. What an example to the writer of Ms Percy’s original. I do hope that Ms Percy and the Trust are reading and taking on board these sentiments. 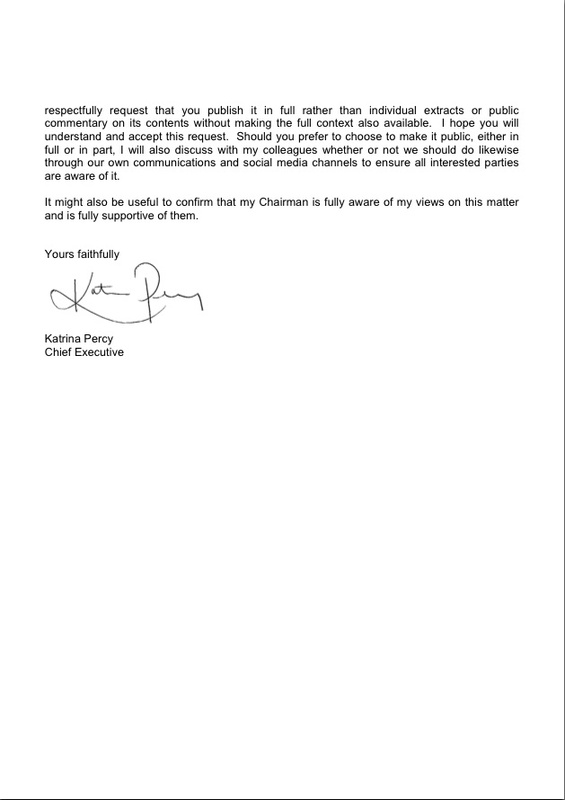 Excellent written letter which says it all…….. Solidarity…..
Katrina Percy your letter is contemptuous – you really are an odious women. Justice & Recognition for LB…… Solidarity….. I feel genuine rage at this, so God knows how yourself and your family must be feeling – “I believe in openness and transparency”… but, no, I won’t answer your questions openly, because people might see it (and form opinions, how ghastly). So she believes that everything she has done is “absolutely right” – hmmmm, really? and the only way to go forward is the way she wants, her agenda, her terms and outside of any public scrutiny – hmmmm, really? …I don’t think so…Truly horrible. How can such a letter be sent to you? And, as she doesn’t want to/won’t engage in bilateral letters does that mean you have no right of reply unless you meet with her? Jeez…. It’s just so aggressive! She woulda done just as well to scrawl ” Go f*** yourself” on the back of an envelope and wrapped it round a brick and slung it through your window. And so condescending. “I’m not going to talk to you about this in public. When you calm down and get over your ‘grief’ you can come listen to me explain how things work in my world”. Wow. What can we do to help get this awful person removed from post? This letter was SO bad an idea, wasn’t it? There is barely a sentence that can’t easily be taken to pieces. We do get that you are a Leader, Ms P – but so was the Pied Piper. Going where he led was not automatically a great idea. And being enthusiastic about Social Media is not the same as understanding that it is NOT a platform for pushing your own agenda – which is not coming across well at any point. Several years ago a beautiful young woman died in the bath in her own home. We had provided that home and worked with her and her mum to achieve that dream. Dad phoned me as I was at home putting Lasagne out for loads of kids round the table. I will never forget that night or that time. I spent the next days at her mums side. I have never seen anyone cry so much in all my life. It was tragic, we went through every possibility. Dad was just aimlessly walking about not speaking. I went with my husband to her funeral, we all heard and knew about their fantastic daughter. All the time I hoped and prayed that i had not failed in my duty by leaving a bath in the house. Not to do with negligence which could have been very clearly the case, but the fear a young girl had lost her life and it could have been prevented and that would be something that I could have prevented. Mum thought about the bath, Dad said he wished he’d put an axe through it. We held on there together. I didn’t try to duck, just felt the terrible grief. I was torn and devastated but not anything like Mum and Dad and her family were feeling. The inquest several months later did show a different situation than I certainly feared and dreaded. She had died of natural causes and not drowned. I will not go into it. She had a sudden death in epilepsy on probably one of the happiest days of her life. It could have happened anywhere. The relief was not about not being sued or being held accountable. It was about that she died in a place she lived rather than falling under a bus. It was about relief that a young girls life was not cut short by my failures. A big lesson about many many things and very many emotions. Never forgotten. I found her funeral service yesterday tidying up some papers in my old office. Oh my God the memories came flooding back. Throughout her Mum and I shared days together. I was a service provider for housing not a big buddy. But eventually her mum worked for us spreading the message about living a good life. She is a very close person in my life to this day. Buddy doesn’t describe it. I’ve shared her agonising times. I saw her collapse one evening when we were all watching Mamma Mia” not knowing the song ” slipping through my fingers”. And what it would mean. Every word as we watched it stuck in my throat till it burned. My position was CEO. Yes and very proud of what we had achieved. But not so arrogant I need or would ever need a lawyer to help me with a letter as this Director certainly did. Why can’t she just learn, reflect and apologise and be compassionate, not try to score points.? 9000 people. You mustn’t know any of them that’s nothing to be proud of. A young girl again. She didn’t know her or her family. Why not? I say to you SH just back off with letters like this. It’s mean, cruel and indefensible. Stop trying to justify yourself and get right off your high horse. Just feel the pain and be compassionate and have some dignity in your actions. This is uncalled for and downright cowardly. Face the music. I worked as a non exec at a mental health care trust for several years. The attempts to cover tracks, defensiveness, blame culture and arrogance was unbelievable. I went in very naive and came out very educated about how it all works or stinks to be often more truthful and accurate. Over the years in my long working life I was fortunate enough to meet men and women who had reached the most senior position in their field and or organisation. I sat at dinner with an elderly, very respected and notoriously ‘wise’ ‘leader’. I asked what he/she felt was essential to successfully and long term lead from the top. This person said ” humanity and humility”. He/she went on to say that ”self belief is very important but without the other two it ends up as pushing rather than leading”. 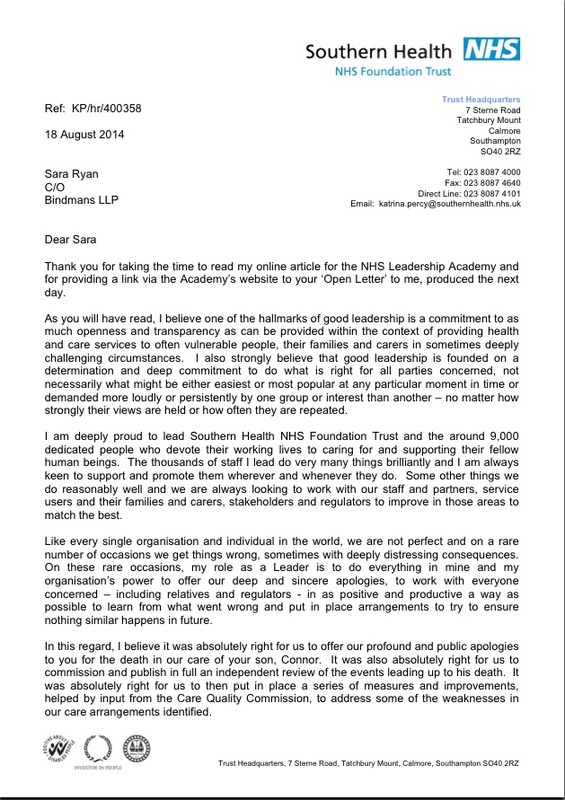 (Bag of sweeties to anyone who finds either humanity or humility in this letter). In this letter, this CE has marked her own homework on her own (self belief scale) of ‘leadership’ ability. I suggest, that she respectfully asks for an appraisal session with her Trust remuneration team, plus chairman. And that in this session she asks them where they see her behaviour and her style on the push or lead scale. How can any professional come out and say the are proud that someone vunerable died in their care? How can any come out and say they are proud of an organization who then goes on to lie and cover up saying it was natural causes? There are failings in all organizations and most peolpe appoligise, learn from it, but when something of this nature happens on this scale and you send damming letters and acusssations at grieving parents and families you are adding insult to injury, alongside of being very cruel. Your letter and your points of view lack maturity, you may be the face of the Nhs but you will not cover this up,and it will be talked about and highligted many a time because it was so wrong in so many ways on so many levels. This young man was loved by so many, yes not just by his immediate family you tried to sweep under the carpet of your ,decit, and yes he was well valued liked and loved , also respected he will not be forgotten! Scary. KP’s hollow shallow defensive self congratulating arrogance laid bare by her own words, the eloquence and grammar of a 15 year old. How did she get to to be “Leader”? I am not linked in any way with this case, and only happened to see it on the news this morning. Having seen so much about Hillsborough in the past few days, I recognized something akin here in our Health Service. The years are passing yet again. Again people’s lives and trust put unwittingly into incompetent indifferent hands. Move her on. could not agree more Matthem. KP’s letter is primitive, idiomatic and full of self praise. I think, the biggest catastrophe is, that she genuinely does not see her own failings. Her arrogance and her simplified version of events is frightening. She needs sacking. She’s rude, and talks out of her arse. She doesn’t care about anyone except for her money. People have called for her to resign and she doesn’t. How much does she have to fail and damage caused before she is forced too. She’s dangerous and arrogant. On her arrival she systematically stripped out pretty much all the existing middle management who had decades of mental health experience and surrounded herself with her gang of wannabes, grabbing at neighbouring trusts, to increase her empire ensuring a bigger pay packet and diluting the experience of the successful and respected Hampshire partnership trust, it’s time to speak to those staff she pushed out from 2010 and hear what really went on, from the bullying and belittling of staff who were pushed out….., what are her nursing qualifications exactly. . . . .